it took 5 hour and 3 men to put it up i wished i paid for professional installment it very nice and the size is good enough for a dinning set or a seven pieces seating. The outdoor yard has become an extension of the living area and at Riverstone we recognize this. The ACACIA Gazebo program was designed for homeowners and outdoor enthusiasts looking for the best quality furnishings to extend their outdoor living experience. Proudly Made in the USA, the ACACIA Gazebo program offers the enthusiast the ability to extend their covered living area with the safety and security provided by our heavy duty, but simple to assemble design. Our rust free structural aluminum frame will last a lifetime. The Electrostatic finish makes the frame even more durable and attractive. The electrostatic finish sends an electric charge through the paint and the frame to help cause a chemical (ionic) bond, much stronger that simple powder coating commonly found in imported versions. Our hidden ground attachment system makes sure that the ACACIA gazebo will stay where you want it to stay and eliminates the need to use pea gravel to add weight to the frame and prevent rattling during wind. The ACACIA Gazebo takes over 80 years of American know how into the design and construction. From our quick assembly sculpted heavy-duty legs that can support over 1000 lbs. each and quickly snap together, to our unique frame design. Our canopy 2-piece covers are designed to allow for ventilation under the gazebo and to help ensure updrafts from damaging the gazebo canopy. We proudly use Outdura branded Acrylic Marine fabrics proudly made in the USA. With over 30 colors available, we are sure that there is a color to match your exterior and your needs. Our Outdura canopies are UV protected, and designed to resist fading and staining for 7 years. 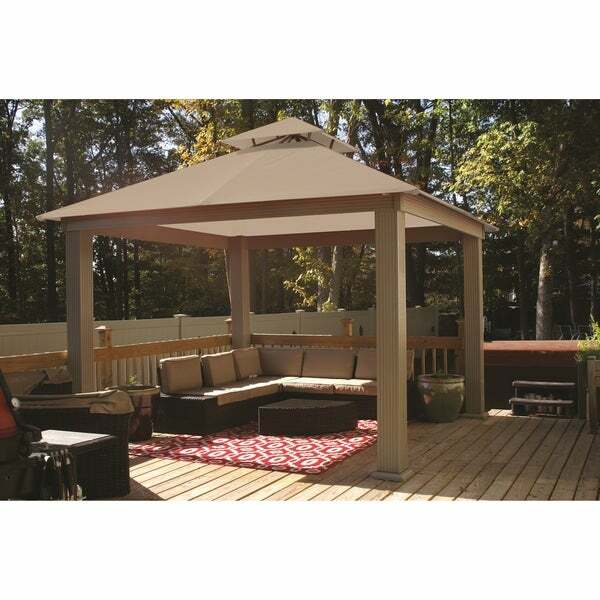 The best part of the ACACIA gazebo is that your dealer can sell you any of the replacement gazebo covers should you need a replacement or would like to change the color. If you're looking for a quality product that is Proudly Made in the USA by former military personnel look no further. Dimensions 144.0 In. X 144.0 In. X 138.0 In. "What are the dimensions "
Dimensions are:	144.0 In. X 144.0 In. X 138.0 In. "Hi I am very interested in your product I would like to know how durable is it in high winds? And can it stay up all year long ? " This gazebo has not been wind tested, but we recommend that if the winds are going to be over 25 mph that you remove the canopy just to be on the safe side. As for, having it up year long, it depends on where your located.Where there is snow, we definitely recommend removing during those winter months.